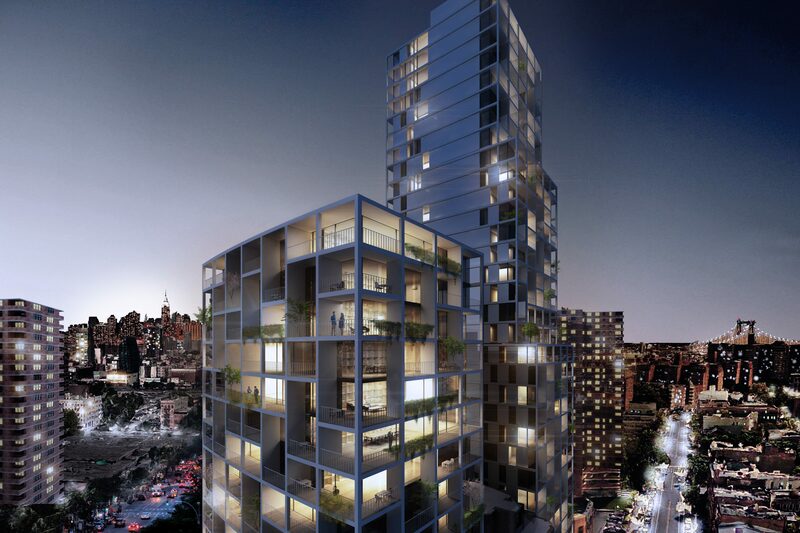 The Lower East Side’s ongoing development boom has been substantial, with projects ranging from Essex Crossing to One Manhattan Square now nearing completion. But in between those two sites, on a seemingly forgotten block of East Broadway, plans are in the works for another two high-rises. YIMBY last reported on 226-232 East Broadway back in 2016, when the Ascend Group acquired the buildings and lots for $47.5 million. 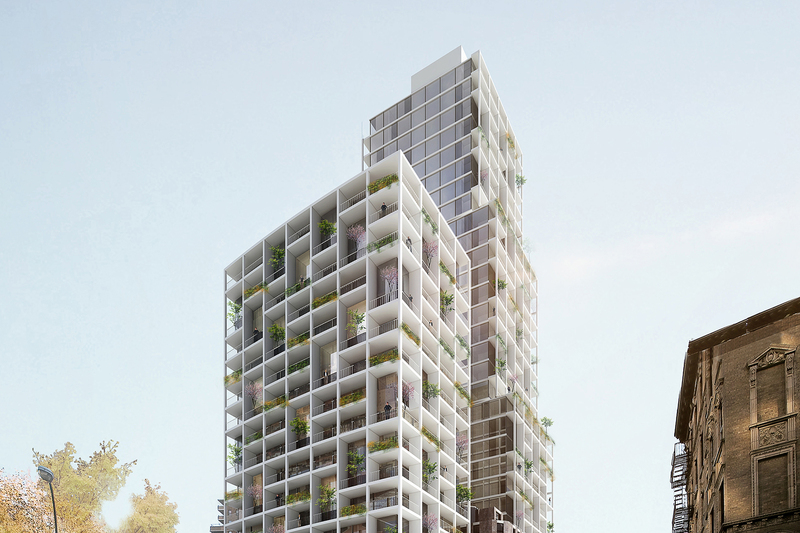 Today, we have the exclusive first look at what’s expected to rise on the site, with two towers of 20 and 36 stories apiece expected to flank the landmark former nursing home at 228 East Broadway. Permits have yet to be filed for the site, but the plans call for the new towers to total approximately 240,000 square feet. Space 4 Architecture, aka S4Architecture, is designing the site. Our goal was to design two buildings that would socially and proportionally integrate with the surrounding neighborhood fabric. It was important for us to avoid the monumentality which is often associated with similar developments, and instead provide a sense of belonging and individualization for the future residents. The plans are certainly an improvement over the currently forlorn state of the former nursing home. The surrounding neighborhood is largely composed of tower-in-the-park style developments, and much of the area has been completely frozen in time since these were built. While piecemeal infill of the “Tower in the Park” plans that dominate the neighborhood is beneficial, an overarching redevelopment scheme would help undo the damage wrought by the extant architecture, which is quite hostile to pedestrians. A strip of pre-war urbanity remains to the south, between East Broadway and Madison Streets, but the immediate surrounds to the north contain empty green space and unattractive apartment buildings. Essex Crossing is about two blocks to the north, while the waterfront skyscrapers surrounding One Manhattan Square will be about five blocks to the south. The East Broadway station for the F train is a short walk and a long block to the west of 226-232 East Broadway, providing convenient access to the subway system. Completion is tentatively expected for 2020 or 2021. 6 Comments on "Exclusive Reveal for Two-Towered 226-232 East Broadway as the Lower East Side’s Skyscraper Boom Continues"
Please pardon me for using your space: In order to remember it by its beautiful appearances. Bang! Beauties. 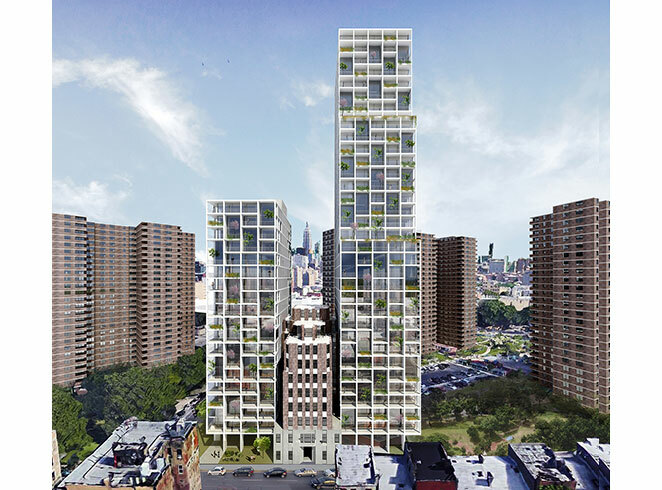 One teeny little problem with these renderings: they are for a 240k sq ft development but the developers only have about 71k to work with since they botched their air rights deal with the neighboring coop. A competent developer would have hired top notch PR and market research people the day they bought the land to start “selling” the deal to the coop. These guys sat on their hands for over a year and hired a PR group that sent around inaccurate and typo-laden materials, then replaced that firm with a professional astroturfer whose MO was sending around fake “grass roots” emails, fliers and text spam. Not a good way to get a 2/3 shareholder vote accomplished. The developers did themselves no favors, but 2/3 is hard to reach in any situation. The board was the most problematic, as they were trying to hedge their support for the referendum with their desire to get re-elected. The last day letters by the president and the late breaking offer of $1 million for lobbies were laughable. As for the fake fliers? I know at least 20 of the people behind the effort, so who are you trying to defame? There is a group of us going through the lobbies, staffing tables and hosting house parties. I would not discount a real shareholder effort simply because you are down on some people. Please pardon me for using your space: Now this I like. A massive improvement over the other dull, uninspired towers going up in the Lower East Side. The design is usually fresh and unique for NYC – it is good. But I wonder about those white slabs and ceilings and what happens with rain and city grime. Proper detailing is extremely important for these types of neomodern designs as too many stained newer buildings now prove. Lets hope the architects are truly qualified.